Wired vs. Wireless Dog Fence: Which is Right For Your Pooch? Dogs are an integral part of the family and need to be protected from harm. Because of this, fences are often installed in yards to help keep them from running off or from being taken. However, it’s very difficult to choose the best type of fence to safeguard your dog with. Do you go the traditional route and choose a physical fence or go more modern and use technology to help keep your dog safe? While traditional fences are still used, wired and wireless dog fences are becoming even more popular today for many reasons. They’re not only affordable, but they keep your yard open rather than enclosed. This article is an examination of wired vs. wireless dog fences and considers the pros and cons of each. If you’re considering whether or not to try a wired or wireless dog fence (both also known as invisible fences) for your yard, read on! 2.1 Are Invisible Fence Systems Safe to Use? 3 What is a Wired Pet Fence? 4 What is a Wireless Dog Fence? The recent popularization of wireless dog fence systems has made many pet owners weigh their options for training and shaping their dog’s allowed areas of movement. Which is the best system to choose, a wireless dog fence or a wired dog fence? We’ll look closely at both options, as both have advantages and disadvantages. Depending on the shape and configuration of your property, the answer may well be to use a combination both! Some manufacturers make combination systems that have both wireless and wired components. These systems are really ideal, in that you can get the advantages of both the wired and wireless world! However, they’re often a bit more expensive than systems that aren’t cross-compatible, and depending on your requirements, may not be needed. We’ll dig into the details below. Both wired and wireless dog fences are considered invisible fences. These systems are electric barriers that are invisible and are designed to keep your pet from crossing over the barrier. The pet wears a collar that is paired with the fence, and when it approaches the boundary, generally an audible tone triggers, alerting the dog. If it continues closer to the boundary, it will begin to get shocked, encouraging the dog to retreat back to a safe area of the yard. These fences are great in that they’re relatively inexpensive to install compared to wood or metal fences, and don’t carve up the landscape or obstruct the view the way a solid physical fence will do. Traditional fences can end up closing up a yard making it look small. With wireless and wired dog fences, however, you can keep your yard open and spacious. There’s no need to block the beautiful view or create artificial barriers that make the yard feel smaller and more cramped, just to control the dogs’ movements. While it might be a little time-consuming, you can install a wired or wireless dog fence yourself. You can buy the equipment and set it up in your yard. This can help to save you large amounts of money because you won’t have to hire an electrician to do it. Of course, wireless systems are much much easier to install than wired systems, but both can be done DIY. Another great thing about using these devices is that they are affordable relative to physical fences that can cost many thousands. You don’t need to worry about high fence installation prices or needing to hire a professional to do the work for you. Because of this, they are perfect for those who are on a budget. There’s also very little maintenance to these systems once they’re set up. You don’t need to paint an invisible fence! Are Invisible Fence Systems Safe to Use? When many hear that their dog is shocked by these fences, they become a bit concerned. While it’s true that your dog is shocked, it’s only a very small amount, and will just give your dog a soft vibration on their neck. It will not hurt them (even when on the highest shock level), but rather keep them aware to not cross the line. On most systems, you can adjust the electrical shock depending on your preferences so it’s a little weaker or stronger depending on how well your dog stays inside the fence, the size of the dog, the amount of fur present, etc.. Both of these dog fences are helpful ways to ensure your furry friend stays safe. While they both work similarly, they are also very different. Because of this, it’s important to consider the benefits and slight drawbacks of each to make sure you install the one that fits your needs perfectly. No matter which choice you opt for though, you can be sure that they will help to keep your yard stylish while also protecting your dog. Virtually all of these systems, both wired and wireless, function on dogs weighing from about 8lbs to about 100 lbs. If you have a very very small dog, the fence may not work, and the collar may be too large to fit around their head. If you have a giant dire wolf, well, you may want to get a physical fence for that! For the vast majority of pet owners, though, either a wired or wireless system will fit their dog. If your dog has a significant amount of fur around its neck where the shock collar is to be positioned, you may need to shave those areas to ensure good contact and effective control. Excess fur reduces the potency of the signal and potentially will block it altogether. Be sure to check the quality of the contact, and also ensure that this area is regularly kept up, as you don’t want to find out that you forgot to shave the dog in the last several months after it has escaped from your yard! Wireless fences are extremely easy to set up, and have some great advantages, but wired fences are also quite useful in many situations. Let’s look each of these designs, and the best uses for each system now. What is a Wired Pet Fence? A wired fence is an underground electric system that keeps your pet secure inside your yard. The wire is placed underground according to the perimeter guidelines you have. After being installed, the wire can then be activated. When it is, an electrical current will be created and will shock your dog when they cross over the wire, due to the collar they are wearing interacting with the current. This depends on the system, but usually, wired dog fences are buried 1-3″ below ground level. They can usually go 6-8″ down maximum before the signal starts to degrade, but regardless, we’re not talking a terribly deep trench to dig to get these installed. And if you don’t want to dig at all, and can hide the wire sufficiently, you could even consider running the wired dog fence on top of the existing ground. However, the wire must be installed in a weather-proof sleeve such as PVC conduit or similar. Depending on your circumstances, you may be able to hide the conduit or paint it to match the surrounding lawn or mulch, in order to avoid digging altogether. All wired dog fences must be set up in a loop in order for the power to be engaged. The power system needs to be connected on both ends to transmit the current through the fence to enable it to be functional. This design guarantees that your dog will have a complete barrier, and will quickly know where it can go and where it cannot go. Ideally, you should map out where you want to bury the wire beforehand to make sure you have enough of it and that it will properly connect together. After burying the wire, you can then connect its transmitter and put it in your garage. Wired fences work well on uneven ground in circumstances where wireless signals may run into issues. If you have a rolling yard, or areas that are blocked off by retaining walls and the like, a wired fence may work better than a wireless fence in these conditions. Wireless fences essentially broadcast in a circular shape around the central transmitter. This circle can be adjusted to increase or decrease the radius, but really can’t be tweaked much more than that. Since most peoples’ yards are not circular, this sort of fence may create odd boundaries, especially for those who have small with different sized front, back, and side yards. Wired fences, on the other hand, can be run in any shape, so if you have a long, narrow yard, you can run your wires in that shape. If you have a perfectly square yard, you’re good. If your back yard is much bigger than your front yard, no problem! Wired fences work great at restricting certain areas of the yard. Wireless fences essentially broadcast in a circular shape, and cannot be cut into sub-sections. If you want to keep your dog out of the driveway, or the pool area, the garden, or the kids’ outdoor patio area, a wired fence will work perfectly in these situations. You can run a bit of wired fence around these areas and close them off to your dog. One of the biggest problems with wired fences is that if the dog escapes from the fence, most designs result in the dog having to endure another shock in order to come back home. This is obviously not a good system, and creates really weird training incentives for the dog! Some systems have different designs, but most function this way. Wireless systems don’t run into this issue, and most combination systems don’t, either. A wireless fence controls your dog in a similar way to a wired fence, but without any wires buried in the ground. Your dog will wear an electric sensing current collar which will interact with the current when they cross the boundary you set for them. However, with a wireless fence, an invisible signal will be put out from a controller or transmitter. You can put this controller in your garage, inside the house, or in most cases, outside, and it will send out an invisible boundary with a radio frequency. A wireless dog fence requires you to activate the collar and transmitter that are connected together. After doing so, you can then set a boundary mark with the transmitter. You should have someone hold the collar where you want the boundary to be set outdoors so the transmitter can properly sense the correct distance. You’ll need to do this a few times in certain areas so that the transmitter can understand the main boundaries to ensure your dog stays in them. See our round-up here for details on the best wireless dog fence for your needs if this sort of system is right for you. Unfortunately, most yards aren’t circles, and most houses don’t have an equal amount of space in front of the house and behind the house. Consequently, you’ll need to find an appropriate area for your wireless transmitter so that it will give the dog a good deal of room to run, but will prevent the dog from going where you don’t want it to go. This can be a challenge, depending on your yard’s configuration! There’s no way to define no-go zones with these systems, so the setup can be a bit of trial and error to get a suitable area and range. Here are a few advantages to a wireless fence compared to a wired fence. If you hate to dig, then a wireless fence is definitely for you. There’s no need to trench anything, no need for any digging here at all! Simply set up the transmitter, configure the range and shock level and put the receiver collar on your dog. From there on, the dog will receive an audible alert, and then a shock, if it goes too close to the boundary. In many ways, you can think about setting up this system sort of like setting up a wireless router. You plug in the transmitter in the desired location, and an area is blanketed with coverage. You don’t need to do much additional setup, other than defining the range and power of the system. The way the wireless systems handle pets escaping beyond the allowed area is definitely better. Most wireless systems make an audible tone when the dog gets near the barrier and then proceeds to shock the dog if it persists. Should the dog continue past the barrier, it will continue to get shocked for an allotted time period (say 10 seconds), and then an emergency signal will go off. The shocking will cease, and the transmitter will beep, informing you that the dog has escaped. The system will not be re-engaged until you restart it, ensuring that the dog won’t get shocked if it tries to go home. This is a big advantage over wired systems and prevents the issue of dogs being punished for trying to go home. One thing to consider before using these fences is if there’s a backup battery built into them. Since they both run on electric, if the electricity ends up going out, your fence will as well. This means your dog won’t be protected. Because of this, make sure there’s a built-in backup to ensure your dog stays safe. Most of the dog collar receivers have rechargeable batteries in them, and most companies will sell replacement batteries as needed. Another important thing to look for in these devices is if they have adjustable shocking amounts. While most do, not all models have this helpful feature. This is good to look for because it will allow you to set the shock amount to a low or high setting depending on your dog. This way, you can be sure they stay within the fence boundary so you don’t need to worry about them getting loose. Most models will vary from each other depending on their boundary amounts. Some will only cover a short distance while others can keep your dog inside a few acres. You’ll want to consider how large you want your invisible fence to be to ensure that your dog can move around freely but at a distance that’s comfortable for you. One of the great features of a wireless dog fence is that it’s portable! If you like to take your dog with you on trips, maybe camping, RV-ing, or you’re a Van-Lifer, a wireless system can be a great option! These systems are portable, and you can immediately control where your dog can go without requiring it to wear a leash. Set the distance around your vehicle or campsite, and the dog can roam at will without you paying too much attention to it. Some manufacturers have systems that work as a combination of both wired and wireless invisible pet fences. These systems are often a bit more costly than other systems, but they have the advantage that they can use the best of both worlds. Use the wireless system as your base control, and then use the wired areas to define subsections and boundaries you don’t want your pet to enter (e.g. the garden, the driveway, etc.). Additionally, should you have some areas of difficult topography or significant changes in the grade where a wireless system won’t broadcast, you can wire those areas. A single collar will work with both systems, and the cumulative effect is quite successful. If your home and desired configuration will work perfectly with a wireless fence alone, we would definitely suggest you use a wireless fence. There’s virtually no setup, and the safety is a plus. But most homeowners don’t have those circumstances, and consequently, the use of a combination system may be the most cost-effective and convenient. The PetSafe system is one of the notable combination systems and is an excellent option for many pet owners. It is our favorite wireless invisible fence system, but they also offer many wired system build-outs that are compatible. 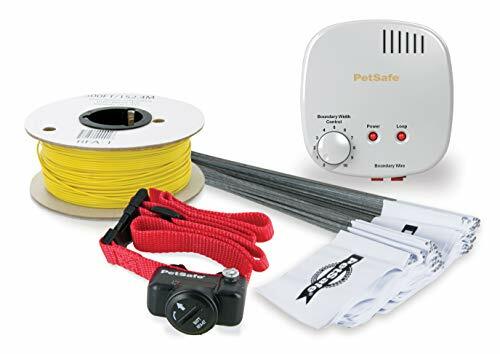 You can purchase a wireless PetSafe system that will do the basics of defining the boundary your pet can travel within, and then you can supplement that system with wired fencing around pools, driveways, garages, and other areas you don’t want your pet to traverse. Do It Yourself Containment - Misc. For most pet owners, a wireless dog fence seems like a godsend. 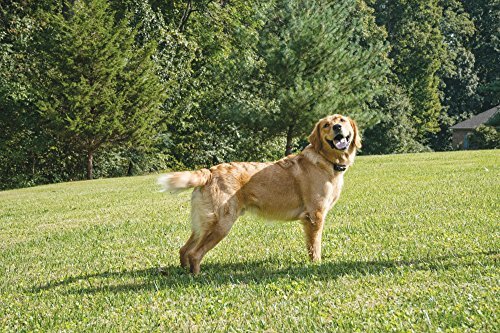 Essentially no installation, and an instant barrier for your dog that will help keep it contained, and safe in an appropriate zone of your yard. And for many, this is the case! However, it’s hard to get the finer details with a simple wireless system, as there’s no nuance. If you have sub-sections you want to keep the dog out of, or if you have an oddly sloped or shaped lot, a wireless system may not be exactly what you need. The wired fence has some benefits as well, and in the end, combination systems are often the most effective. Time to let your dog run free, inside the invisible fence!